Hospitals usually are uncomfortable and unfamiliar places for kids; examinations and operations are a cause of anxiety and fear in the little patients. Play therapy and toys for hospital preparation can relieve these feelings by informing and preparing children about what to expect during their hospital visit. 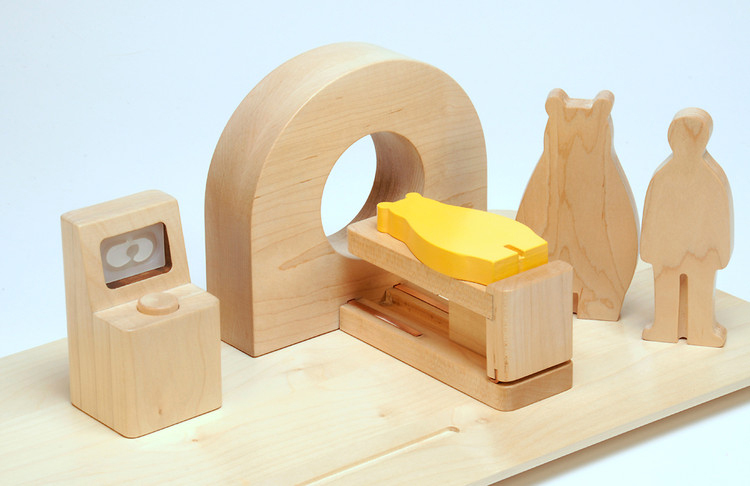 Novel Hospital Toy, is a wooden toy designed by Hikaru Inamura targeting on psychological care for children that are going to face medical examinations at hospitals. It is composed by different hospital machines like X-ray, CT, ECHO and ECG. 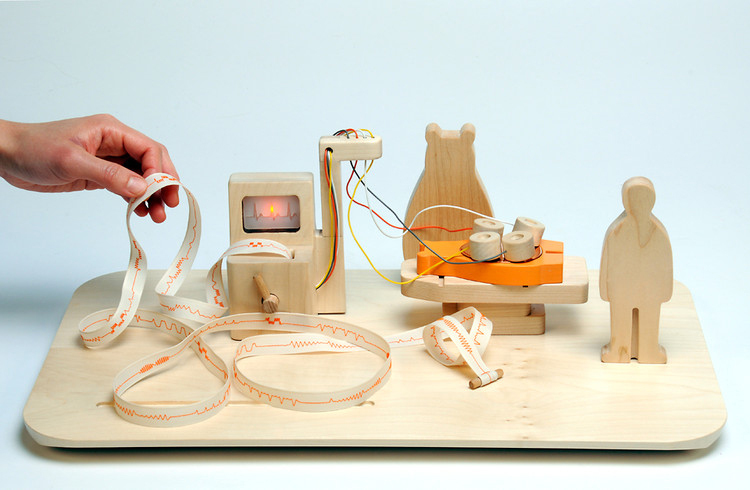 Each machine-toy has a picture book with simple stories, written in just a few lines, to introduce them, as well as the friendly characters within, before to play. It is remarkable that every toy is designed also to give light or sound feedback in order to facilitate kids to imagine how these machines work while they are playing with them, maybe in the waiting room. Hikaru Inamura observed during her visit to Astrid Lindgren Children’s Hospital that kids use pretend play to reduce their psychological fears of medical procedures. For example, hospital play specialists get children to pretend to perform a surgery on their doll, developing a positive mindset to receive treatment themselves during the process. For this, they use actual medical materials on special dolls with different body openings, pictures and books. The hospital has also a website that children, depending on their age, can use for their mental preparation before coming to the hospital. It is important that hospitals let children to learn about illness, hospitalization and medical treatments through the play. This way the examination is perceived more as a kind of adventure they pre-experience through the characters, this way getting familiar with it. They need to remove easily their fears about it and have answers to their typical questions like: it finishes soon? is it painful? parents can be together? and so on.. In addition, since some examinations need to be done by the children without their parents, it would be better to inform them before about what will happen during this time so, what better way than playing? So while playing with Novel Hospital Toy kids get prepared for the medical examinations that are not well-known and are not easy to explain in words, like X-ray, CT, Electro Cardiograph and Echographic examination..
To allow kids to play with toys that help them reduce fear and anxiety for hospital preparation is a very good sign of the different attention we can have at children’s psychological well being, having always in mind that often when they cry and ask us for impossible things is just to tell us that they are uncomfortable in that situation. This is a best practice valid also with autistic subjects, where the possibility for them to foresee a new or unfamiliar situation is the best way to reduce the related stress. As well as preparing to the experience, to play with these toys also help children after hospital examinations, allowing them to feel more confident in sharing their experiences with their family. 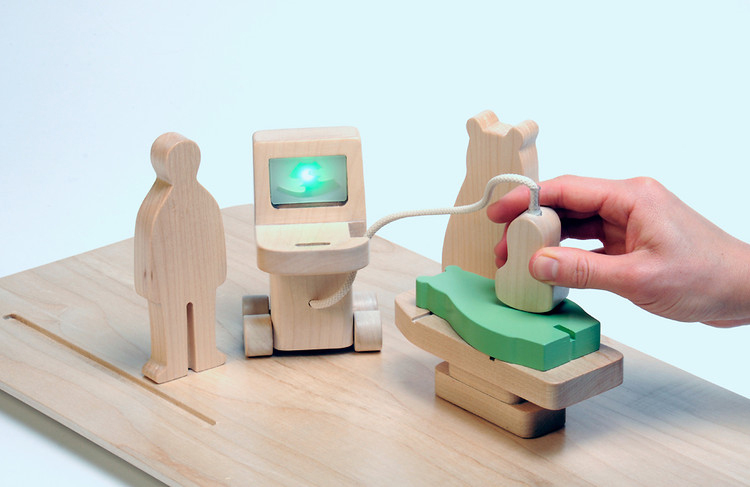 Nowadays, the Novel Hospital Toys set is still at prototype stage but it would be wonderful to see in the near future these products in hospitals and see how kids play with them and make easier their visit to the doctor.